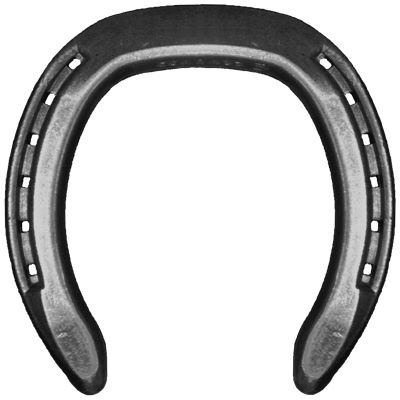 The Aluminum PLR Race Shoes are used for a wide variety of disciplines ranging from race horses, barrel horses, cutters, and many other gaming & speed event horses. Show horses and rodeo performance horses find the light-weight aluminum to be beneficial for traction, and the design features help keep the horses from interfering & forging. - The Aluminum PLR shoe is made of a forged aluminum alloy that is heat treated for added hardness. This combination offers a light, yet durable shoe for optimal performance. The Aluminum PLR Race is the next generation in aluminum performance foot wear for horses. As the demands on performance horses has increased over the decades, so has a need to update the way we care for their feet. The latest information regarding pathology in pleasure and performance horses is suggesting that the lack of leverage relief offered by either foot wear or the terrain is a primary cause. Strain or lesions on the DDFT and the connective tissue around the coffin (DIP) joint is a growing concern based on MRI findings over the last several years. Because horses were not particularly designed to turn and run in tight circles, the joints in the lower limb and especially the coffin joint takes a beating. When the connective tissue and the joint surface itself becomes traumatized, the soundness & performance of the horse rapidly decreases. Reducing the leverage to the joint by bringing the breakover point of a shoe within a given proximity to the center of articulation has proven to be extremely beneficial as a treatment protocol. When this approach also includes the reduction of leverage both medially and laterally, the results are even better. Now that we have a better understanding of the causes to so many of these pathologies, and the treatments that are working to remedy them, we now have some guidelines on ways to prevent these lameness issues.